The AAPG/AAPG Foundation Imperial Barrel Award (IBA) competition is a programme for post-graduate, primarily MSc, geoscience students. The programme gives students a taste of the role of a geoscientist in the exploration business. Universities throughout the world take part in what is probably the largest student competition organised by any geoscience society. Europe Region Teams, Prague, 2014. Teams that successfully apply to join the programme are provided with a dataset comprising seismic and well data from a sedimentary basin. The objective is for the teams to interpret and analyse the data to evaluate the petroleum prospectivity of the basin within an eight-week timeframe. Participants have access to a number of online training modules provided by Shell and Subsurface Consultants & Associates (SCA), which are of particular importance to universities that do not have petroleum geoscience programmes. The teams present their findings and recommendations to panels of industry experts, initially in regional semi-finals and ultimately at the global final, held just before the AAPG annual convention. In 2016, 147 teams, representing 42 countries, took part in the programme. We estimate that more than 1000 students participated in, and learned from, the programme. The origins of the IBA go back to 1976 when Prof. Richard Selley created the programme as part the Petroleum Geoscience MSc course at Imperial College, London. Initially it was a field development project in which integrated teams of geoscientists, geophysicists and petroleum engineers were given a subsurface dataset from an oil field comprising a 3D dataset and a number of wells to mimic the appraisal/early development phase. The teams were given three weeks to interpret and evaluate the data and present an initial field development plan, including assessment of stock tank oil-initially-in-place (STOIIP) and estimated ultimate recovery (EUR). Later, under the leadership of Prof. Howard Johnson (recipient of the AAPG Murray Distinguished Educator Award), the programme at Imperial College evolved into a more regional analysis of basin evolution, hydrocarbon systems and petroleum prospectivity. Teams of geoscience students were given 5 weeks to complete their interpretation and evaluation before presenting their results to a panel of senior industry professionals. The prize for the winning team was a barrel of beer donated by AAPG affiliate, the Petroleum Exploration Society of Great Britain, hence the name Imperial Barrel Award. In 2006, Steve Veal (AAPG Honorary Member and at the time AAPG London office director) was asked to join the IBA judging panel at Imperial College. He immediately saw the potential for expanding the competition globally under the auspices of the AAPG. Howard Johnson and Steve Veal wrote a detailed proposal of how the competition would work and this proposal was subsequently approved by the AAPG Executive Committee in May 2006. The AAPG Student Focus Coordinating Committee took the lead in organising the first competition, which was to be held in association with the 2007 Annual Convention in Long Beach. 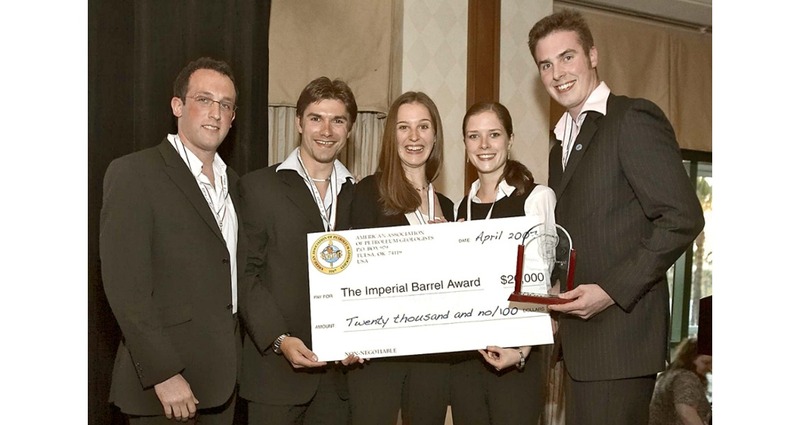 University of Aberdeen, 2007 winners of the Imperial Barrel Award. Seven universities were invited to take part in the first competition, four from the US (University of Oklahoma, University of Houston, California State University – Long Beach and University of Wyoming), two from the UK (University of Aberdeen and Imperial College London) and one from Russia (Gubkin Russian State University, Moscow). The University of Aberdeen took the top honour, the Imperial Barrel Award; Imperial College were in second place being awarded the Selley Cup; and the University of Oklahoma were placed third and were presented with the Stoneley Medal. 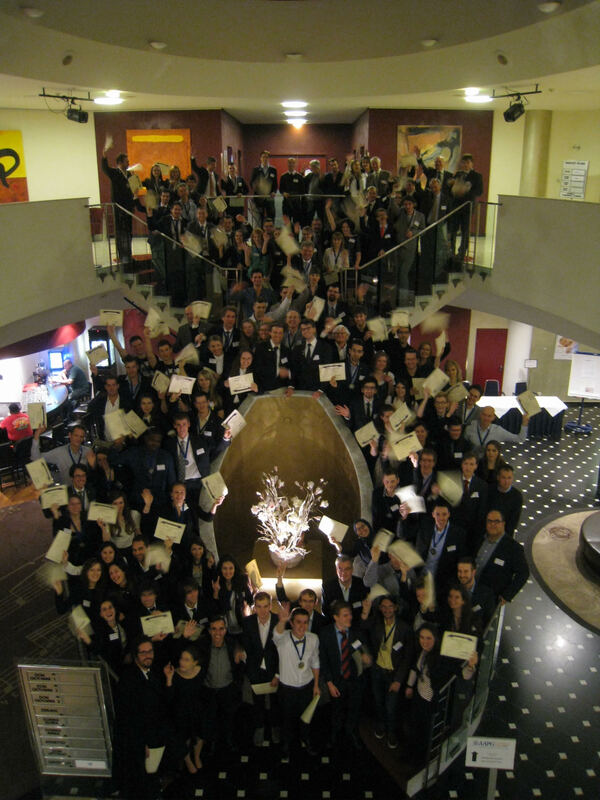 Since that first competition, the AAPG IBA programme has gone from strength to strength. The number of universities taking part has risen from 7 to 142 in 2016, the tenth year of the competition. The number of students directly involved in teams reaching the semi-finals and finals has risen from 35 to over 700. The IBA is one of AAPG’s most expensive programmes. Fortunately, we have some very generous sponsors from industry, AAPG, and individuals. Major sponsors include Schlumberger, Shell, Saudi Aramco, the AAPG Foundation, Chevron, Anadarko and Devon. The value of the competition lies not only in the educational opportunities it provides but also in the opportunities for students to network with experienced industry professionals to gain insight into what a career in petroleum exploration might offer. Sponsorship has grown and long term financial commitments have been made because the industry holds the IBA competition in high esteem. Students find that having participation in the IBA on their CV is an important criterion in the successful search for employment in the industry. The complexity of the IBA programme demands the time of numerous volunteers and AAPG staff around the world. Participating universities are in different time zones and hemispheres and have differing curricula and course lengths. Some universities incorporate the IBA programme into their curricula; in others students have to work at night time and weekends. Many universities run internal multi-team competitions in order to determine the team that will represent them at the semi-final. The future for the IBA is good if industry support continues and the costs of the programme are controlled carefully. There is still the potential to expand the competition, although we are probably reaching a financial and logistical barrier in Africa and Europe. The success of the programme will continue to depend upon the numerous willing AAPG volunteers and dedicated AAPG staff. Judging Panel, Global Final, 2013. What makes a sedimentary rock an effective petroleum source rock? A review of the analytical methods used to characterize source rocks for successful petroleum exploration and production.